Slav Simanic really cuts it. "Water Of Life" is fiercely potent mix of Satriani's languid cool and rampant road tunes, combined with Malmsteen's more thoughtful neoclassical moments, rounded out by some striking Floydian sonic shapes. Yes it's Christian rock, celebrating headline Biblical events, utilising occasional voice-in-sky narration to create a dramatic backdrop for this talented guitarist's songs without words. Simanic'c secret is to keep it simple. None of those Kuprij/Howe wanking your dreams on a fretboard scenarios. 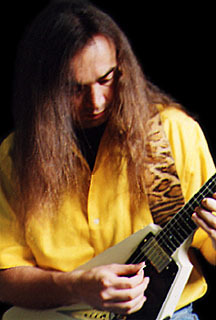 On most tracks he first lays down a tough rhythmic backbone, with bass, drums and rhythm guitar locking seamlessly together on mantras constructed from simple chord progressions.Having built these solid soundscapes, Simanic's lead guitar is then free to veer off on tangential plotlines or to fashion filigreed melodies around the album's theme of faith, belief and immortality. Title track "Water Of Life", "Sudden Awakening" and "Life Is A Highway" may all sound like Eddie Van Halen, Gary Hoey and Joe Satriani jostling and jockeying through chiacanes, hairpins and full throttle straights in a four minute Formula One axeman's frenzy, but in the titles at least, "The Lamb Of God" and "Passover" are the rock guitar equivalents of a DeMille biblical epic. These tracks employ spatial sound fx or deeply intoned commentary to set a cinematic mood. The first, an overture in true classical tradition, is vibrantly emotive, but thankfully shorn of the show off's tendency to go wildly over the top. The second is the album's centrepiece, translating the flight of the Israelites from Egypt to the Promised Land a dynamic, biting melody, climaxing in an explosive parting of the Red Sea and the dash to freedom. (don't try this at home kids). In comparative terms other tracks are more prosaic, but equally moving. The instrumental ballad "Living In Love" will soften the hardest heart, or pierce the thickest skin. The slamming, sliding "Holy City" is ambitious and wholly absorbing, while "Resurrection Suite" returns to a classical format, opening with a dancing keyboard motif which suggests Jean Michel Jarre and Mike Oldfield, before Yngwie and James Byrd ramraid the studio and torch place with fiery axework. "Days Of Ease" is the one true song on "Water Of Life", featuring vocals by Simanic's fellow Canadian Phil Naro. A danse macabre for the dissonant nineties, a sobering, yet uplifting reminder of just why we're here. Naro's skilled interpretation transforms a difficult lyric into a living song, and makes it sound effortless. Awesome. A word which sums up the album really.